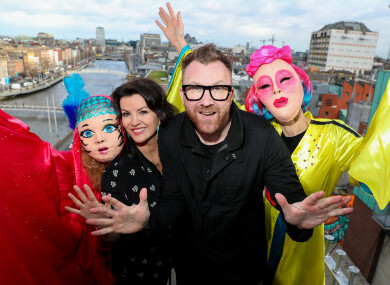 COMEDIANS JASON BYRNE and Deirdre O’Kane have been announced as grand marshalls of the Dublin St Patrick’s Day parade. The announcement was made at the Clarence Hotel in Temple Bar this afternoon. They’ll lead the traditional, large-scale parade on Sunday week, following the usual route from Parnell Square on the northside to Kevin St on the south of the city. The Dublin St Patrick’s Festival gets under way next Thursday, 14 March, with events running until the Bank Holiday Monday on the 18th. Email “Comedians Jason Byrne and Deirdre O'Kane announced as Paddy's Day grand marshalls ”. Feedback on “Comedians Jason Byrne and Deirdre O'Kane announced as Paddy's Day grand marshalls ”.